We all know we should be prepared for opponents. It is essential in disaster preparedness to organize a disaster survival kit. Searching the Internet regarding this topic, you will find several sites that catalog the basic recommended items that your survival kit should contain. You can find out "what" and "how much" of each item is recommended in order to be able to survive for a minimum of three days. You should print out the list, purchase the items, squirrel them away and hope the need never arises. However, most of us will never follow through with the task. Time is valuable and seems to get exhausted focusing on matters that are currently necessary. Those who do take the initiative in putting a disaster kit together, find that the individual items can be costly. The physical size of the kit can be an issue as well, and portability can become very difficult. Instead you should give consideration to purchasing a ready-made emergency kit. Manufacturers have already done the research, procured the basic items in the recommended quantities, made them lightweight and portable, and offer the essential basic kit at an affordable price. A survival kit includes many products that most of us would not have considered necessary until the time of need had come to pass. There are a variety of survival kit products available. Some are packaged in storage buckets. Others come conveniently packed into backpacks. There are individual survival kits, 2 person survival kits, and smaller kits to keep in our vehicles. There are kits that are specifically designed for children that include items to keep them entertained during a disaster. There's also plenty of extra storage space, which allows you to customize your kit to accommodate your own individual needs. Also, most manufacturers will assemble custom survival kits for larger groups of people such as businesses, schools or churches. Many people have invested the time, effort and money to prepare their homes for a disaster. It is equally important to consider that the home could be destroyed. 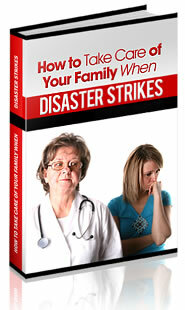 You need to be prepared to take care of yourself and your family if that should occur. First responders and rescue teams may take awhile to get to everyone. A survival kit will allow you to take care of your basic needs until help arrives. Whether it's a self assembled "do-it-yourself" kit or a purchased one, we all need to fulfill this very important element of our disaster survival plan.